This tinerary takes you from Portbou to Querroig, a route through the "Paratge Natural d'Interès Nacional de l'Albera" natural reserve, in these mountains under public management. This route starts at Portbou tourist information office, located in the street named Passeig Lluís Companys, just in front of the main beach. Go along the seafront until you come to the main road, which you cross and then go straight along the street Carrer Sant Jordi. Go up the hill, following the GR92 markers and the yellow Itinerànnia markers, which you will see all along this route. Then continue going up the street Carrer de Sant Jordi until you com to the end of the town. Carry on along the track, following the yellow markers, go past the house and follow the path that crosses through the typical mediterranean scrubland vegetation that you will see all along this route. When you get to the Belistres pass, you will see the vertical AE230 Coll de Belitres signpost, which indicates Querroig 4h45min. Carry on down the track on the left along the rigde with magnificient views of Portbou and later of the french state. The track ends up at the ridge, where you must take an upwards track on the left before crossing the iron fence and following the yellow markers. The track then becomes a path that goes up to the ridge. Go past the dolmen known as "Coll de la Farella" and continue up to the ridge until you see a signpost for the path to Querroig castle. However, our itinerary will go onwards to Querroig ridge and the Taravaus spring. After a quarter of an hour approximately, you come to the ridge of Rumpisó, where you will find an informative "Espais de memòria" platform which says that this path was once used by exiles. From the ridge you can follow the brown "Memorial democràtic" signposts back to Portbou, but our route carries on ahead, following the yellow signs along a path until you come to a track. 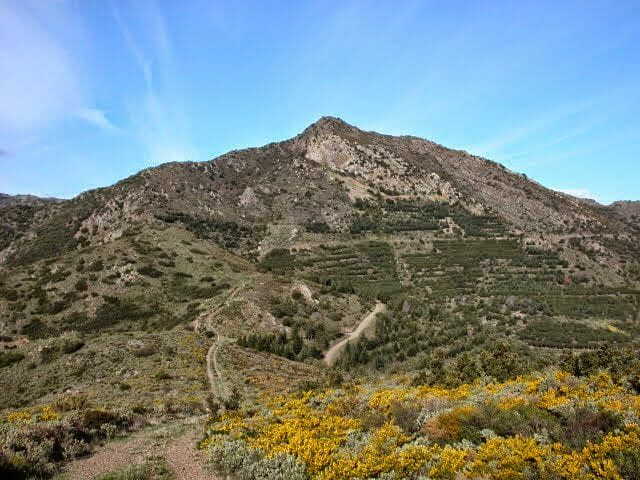 Take this downhill track along which you can admire the scrubland vegetation with pines and the reservoir of Portbou. Continue down to the bottom of the valley and then follow the trail until you come to a path on the left indicating the ridge of LLacers 0,9 kM. take the steep path down to the ruins of an old farmhouse. Then take the sign posted track in the direction of Portbou. Go past the Budellers country house and when you see the road that comes from Rumpisó ridge, follow the directions of the Democratic Memorial. Carry on along the path that follows the creek, go past the Villa Antonia water treatment plant, and you will come to the immense wall of the railway. Cross under the railway tunnel, continue along the street Carrer de la Riera, go down the Rambla de Catalunya and the route finishes at Portbou tourist information office.